A Gautam, R Bhadauria. Fungal Contamination Of few Common Stored herbal Fruit Samples. The Internet Journal of Nutrition and Wellness. 2008 Volume 8 Number 1. The levels of fungal contamination were analyzed in 44 stored dried fruit samples of Emblica officinalis (Alma), Terminalia bellirica (Baheda) and Treminalia chebula (Haritiki), randomly collected from various retailers from Gwalior city (India). As a result of mycological examination, 97.77% of the total samples examined, found to be contaminated with different fungi. A total of 12 different fungal species were isolated from all the three types of fruit samples of Emblica officinalis, Terminalia bellirica and Terminalia chebula. 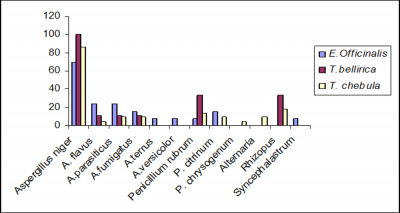 The predominant mycoflora obtained was distributed in five different genera comprised of Aspergillus, Penicillium, Alternaria, Rhizopus and Syncephalastrum. The Aspergillus (71.95%) was observed as the most dominant genera recovered followed by Penicillium (15.44%), Rhizopus (9.51%), Alternaria (1.67%) and Syncephalastrum(1.41%). Most of the identified fungal species like Aspergillus, Penicillium and Alternaria are reported to have ability to produce mycotoxins like aflatoxins, ochratoxins, citrinine and alternaria toxins. The presence of a wide range of storage fungi indicates that the mould probably infects the crude herbal drugs during harvesting and post harvesting processing i.e. mainly during drying, storing, transportation and processing. On the basis of present investigations, it may be concluded that the contamination of raw materials is alarming, as these raw materials needs thorough inspection before being channeled to the drug industries and for public use. Since ancient time herbal drugs– also known as phytomedicnes, are used in the prevention, treatment and cure of health disorders and diseases. In Ayruveda different parts of the medicinal plants as well as the powdered mixture of various parts of different plants- in the form of crued herbal drug, are of equal importance , all of these are being used as medicines for general health disorders as well as for the cure of various ailments. Amla (Emblica officinalis) is a richest source of Vitamin C, and used as a tonic, blood purifier, diuretic and laxative. It is healthy for hairs and used as hair-dye & shampoo . It cures insomnia . It is also a cardio protective. Fruit of Baheda (Terminalia bellirica) contains tannins, sitosterol, galic acid, etc. Fruit is mainly used in cough as well as is used as tonic, laxative, in piles and dyspepsia. Haritiki (Terminalia chebula) fruit contains 24-32% tannins. By sucking the fruit pieces of T. chebula acidity can be cured while boiled pieces are used to stop dysentery. Fruit powder is used as laxative. Decoction is used in bleeding and Ulceration of the gums. In aurveda the mixture of these three fruits i.e. Trifla churn, is prescribed for the various stomach problems such as: constipation or indigestion, dyspepsia, anemia, impurity of blood, hyperlipidaemia, skin diseases, excessive heat, irritation of eyes . These three medicinally important fruits are stored after harvesting, before marketing and processed in to their products. Post harvest spoilage of these herbal fruits by .filamentous fungi is one of the most important threats associated with processed and stored fruits (raw material) and herbal drugs. Discoloration, quality deterioration, reduction in commercial values as well as in therapeutic potential and mycotoxin production has been linked to mouldy contaminated herbal drugs ( Essono et al. 2007). Unfortunately, the number of reports of people experiencing negative effects, caused by the use of herbal drugs, has also been increasing (Vartika & Shanta 2005). Considering the little information on fungal contamination of herbal fruits and drugs in Gwalior, M.P. the objective of the present study was to evaluate the predominant mycoflora and the extent of fungal contamination in stored herbal fruit samples (sun dried stored fruits of Emblica officinalis, Terminalia bellirica and Terminalia chebula) retailed in the market of Gwalior. A total of 44 dried fruit samples of Emblica officinalis (n=13), Terminalia bellirica (n=9) and Terminalia chebula (n=22) were collected in 2007 from various retailers of Gwalior city (India) in clean labeled packets. These samples were sent to the laboratory as soon as they were collected, packed in air tight containers and stored at room temperature. All the samples were examined morphologically and the percentage moisture content was determined. Enumeration of mycoflora was determined on various culture media. Fungi were isolated from different stored fruit samples of Emblica officinalis, Terminalia bellirica and Terminalia chebula on Potato Dextrose Agar and Czapek agar media. Identification of fungi was done on the basis of morphological and cultural characterstics as described by Ananthanarayan and Paniker ,1999. Percentage frequency of individual fungus was calculated by the following formula ( Giridher & Ready 1997). The mycological examination of all the three types of fruit samples revealed that, 97.77% of the total samples were found to be contaminated with one or another fungal species. Emblica officinalis and Terminalia bellirica were found to be highly contaminated than Terminalia chebula . All the fruit samples of Emblica officinalis and Terminalia bellirica were found to be contaminated with various fungal species while in 95.46% fruit sample of Terminalia chebula contamination was observed. Highest 7.59 % moisture content among all fruit samples was observed in Terminalia bellirica fruits whereas, it was 4.06 & 3.77 % in Emblica officinalis and Terminalia chebula fruit samples respectively (tab. 1). A total of 12 different fungal species were isolated from all the three types of fruit samples of Emblica officinalis, Terminalia bellirica and Terminalia chebula. The predominant mycoflora obtained was distributed in five different genera comprised of Aspergillus, Penicillium, Alternaria, Rhizopus and Syncephalastrum. The Aspergillus (71.95%) was observed as the most dominant genera recovered followed by Penicillium (15.44%), Rhizopus (9.51%), Alternaria (1.67%) and Syncephalastrum(1.41%). Fungal species isolated from the stored herbal drugs are shown in the fig.1. 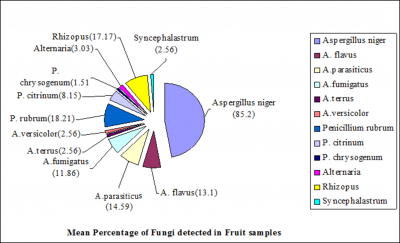 Aspergillus niger, A. flavus, A. parasiticus, A. fumigatus and Penicillium rubrum were found to be most dominating fungal species, isolated from all the fruit samples. A. terrus A. versicolor and Syncephalastrum were isolated only from Emblica officinalis fruits while P. chrysogenum and Alternaria from Terminalia chebula. fruits only. P. citrinum was isolated from both Emblica officinalis and Terminalia chebula fruits while Rhizopus only from Terminalia bellirica and Terminaliachebula fruits. The presence of a wide range of storage fungi indicates that the mould probably infects the herbal drugs during harvesting and post harvesting processing i.e. mainly during drying, storing, transportation and processing. During the survey and collection of samples it was found that from the field these fruits are mostly transported without taking any care about the fruit damage and then these fruits are stored in open, unclean tin containers or in the market, thereby exposing them to microbial infection. Most of the identified fungal species like Aspergillus, Penicillium and Alternaria are reported to have ability to produce mycotoxins like aflatoxins, ochratoxins and citrinine ( Bugno et al. 2006, Aziz et al. 1998, Hitokoto et al. 1978). Aflatoxin contamination of common medicinal plants ( Roy et al.1988 ), fungal contamination of medicinal plants used in churn preparation (Efuntoye 2004), mould profile and mycotoxin contamination in crude samples of drug plants (Choursia 1990), mycotoxin contamination of some kidney curative herbal drugs (Kumar & Roy1994) have also been reported. Although this study did not attempt to examine crude herbal drugs for the presence of mycotoxins contamination, the results showed there is potential risk for mycotoxins contamination, especially during prolonged storage in poorly conditions without temperature and moisture control. Considering the worldwide increased use of herbal products as alternative medicines and the risk, purchase and use of natural products contaminated with various fungi, it is necessary to evaluate the quality of raw materials/ bark, stem, roots, leaves, fruits and seeds used in the preparation herbal drugs and also of setting appropriate standards for toxigenic moulds and mycotoxins in crude herbal drugs and medicinal plants in order to reduce the risk for consumers health. The present pilot study on a small number of three types of herbal fruits therefore indicated that presence Aspergillus, Penicillium and Alternaria toxigenic fungal species in these stored herbal fruits are alarming and is an question mark for the use of these herbal fruits (as raw material for preparation of herbal drugs) being sold in the markets without any moisture and temperature controlled conditions of storage which can therefore either reduce their therapeutic potential as a drug or can harm human health due to their mycotoxins. The authors are thankful to Prof. K.K. Koul, Head, School of Studies in Botany, Jiwaji University, Gwalior, for providing necessary laboratory facilities and Madhya Pradesh Council of Science and Technology, Bhopal (India) for financial assistance. School of Studies in Botany, Jiwaji University, Gwalior, Madhya Pradesh, India.